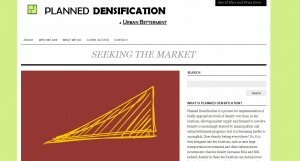 Planned Densification is a process for implementation of locally-appropriate levels of density over time, in key locations, allowing market supply and demand to coevolve. Density is increasingly desired by municipalities and urban betterment programs–but it is becoming harder to accomplish. Does density belong everywhere? No. It is best designed into key locations, such as near large transportation investments and other infrastructure investments wherein density increases ROA and ROI. Indeed, density in these key locations can sustain lower density elsewhere in a municipality.